"... and the stone cried out"
The figurative art workshop annually gathers sculptors from all over the world who give life and shape to the stone blocks protecting the south dock of the city harbour. 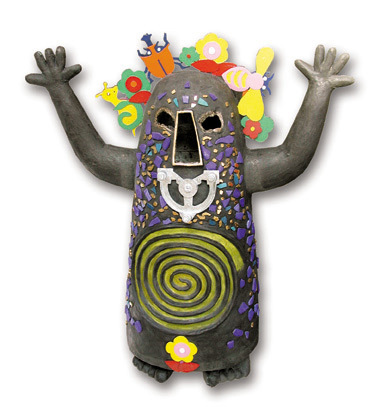 A bronze work by Enrico Baj referring to a theatre pièce by Alfred Jarry, the founder of Pataphysics. Opened on Valentine's Day, the extraordinary sculpture of colored neon by Marco Lodola, is located in Piazza C. Battisti. "Work, work, I prefer the sound of sea..."
A fountain of many coulors simply named ''Allegro'' ("Cheerful") and made by Ugo Nespolo. "Children of the world", a sculpture by Ugo Nespolo placed on the external wall of the Municipal Hall. A work by the artist Giuseppe Marinucci, representing the mythological prophetess. This work of art, by Cleto Capponi, celebrates the courage, strenght and spirit of sacrifice of fishermen of every age. 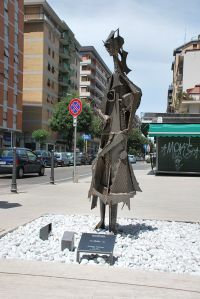 The sculpture by Paolo Consorti, a young but already well known artist from San Benedetto del Tronto, is located on the fountain in Cairoli Street, one of the centre cross-streets. An artwork by the Albanian sculptor Ghenti, dedicated to Mgr Francesco Sciocchetti (1861- 1946). It stands on the wharf "Malfizia'' in front of the retail fish market, facing at the same time the moored fishing boats.